The basic regulations for playing sticks outdoor field hockey game are like soccer. But, players use a hooked stick to play the ball instead of kicking it with their feet. FIH HOCKEY RULES: The game is better known as 'field hockey sticks'. That helps differentiate field hockey regulations used in the open air game from the divergent indoor rules of ice hockey. In fact, 'hoquet' is an old French word for a shepherd's crook. That is how the hockey stick got its name - and hence the origin of the game. Field Hockey rules and regulations get played all around the world. But field hockey sticks is most popular in Pakistan, New Zealand, Great Britain, India, and The Netherlands. UK-wide, 'England Hockey' is the national hockey governing body. The organisation runs the teams on behalf of Great Britain Hockey. The International Hockey Federation 'FIH Hockey Rules' operate from Switzerland. FIH is the body responsible for governing England Hockey Rules. Perhaps the sport's pinnacle occurs in the Olympic Games. That is one reason why the rules of hockey UK have peaked since it got reinstated in 1928. Two different codified ruling publications relate to the game. One represents outdoor hockey and the other relates to the indoor game. As a rule, the rules and regulations of hockey get reviewed every few years. The object of a hockey game is to hit a ball into your opponent's goal using a stick. A point gets awarded to your team each time you play the ball inside their goal net. The winning team is the one with most goals at the end of the game. Field hockey pitch dimensions are 100 yards long and 60 yards wide (91.4 x 55 meters). The field has three lines running across the width (two 25 yard lines and a half way line). There is a goal measuring 4 yards wide in the middle of each end. A 16 yard line marks the goal shooting semi-circle area section. Each player has a wooden stick during the game. It must follow the safety rules of field hockey stick regulations. The stick should have a rounded head with a flat underside. Players use it for control and to hit the hard ball around the pitch. A standard field hockey ball is spherical and made of plastic and cork. The white hockey ball should measure 23 cm in circumference and they weigh around 163 grams. Players wear shin pads and a hockey gum shield for protection. Some England hockey players also wear eye guards and a field hockey face mask. Goalkeepers wear a lot more hockey pitch padding. Their gear includes a face mask, helmet, padded gloves, chest pad, and leg guards. They need extra padding because they are the only hockey player allowed to use their hands and feet in the game. There are 11 players in a hockey team. The team comprises 1 goalkeeper and 10 outfield players. Hockey rules UK allow a maximum of 5 substitutes in a match. Field hockey outfield players consist of defenders, midfielders, and attackers. Their roles have varying positional formations on the pitch. Note: It is not uncommon to use the goalkeeper as an extra outfield player at the end of game. This is a common tactic used when a team is pushing for a win. How long is a field hockey game? The standard time duration of a hockey game gets divided into two halves, each lasting 35 minutes. Play begins with a pass from the center of the halfway line at the start of each half or following a goal. Players take a break of at least five minutes during the half-time interval. The game starts with a pushback from the center spot. 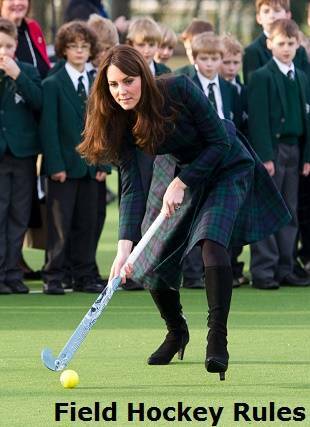 The bully-off is no longer used in field hockey rules UK. Players use their stick to pass and dribble the ball. No other body part can intentionally come into contact with the ball. Tries to hit the ball off another player on purpose or intends to cause harm to that player. Uses a body part with intent to assist in moving, or stopping, the ball. Raises their stick above waist height. Hits their stick off their opponent's stick to interfere with normal play. England Hockey rules also state that players must keep hold of their stick at all time. Players must not use it in a dangerous way or cause legitimate evasive action by players. Players must not play the ball with any part of the stick when the ball is above shoulder height. Exception: defenders can use it at any height to stop or deflect a shot at goal. The 'bully' is only used to re-start a match when time or play gets stopped for an injury. Another time for the bully could be when no penalty gets awarded. Hitting the ball (with your stick) between your opponent's goal posts and over the line from inside the 16 yard area scores a goal. Each goal scored gets one point for the team. You can score a goal from a penalty corner. Penalty corners get awarded when a foul gets committed in the 16 yard area. The defending team lines up on their goal line. The attacking team must all be outside the 16 yard area. One player hits the ball to them from 10 yards either side of the goal line. As the ball gets played back a team mate stops the ball before another strikes at goal. Note: A goal scored outside the 16 yard line will not get awarded and the ball gets turned over. A field hockey umpire is the person with the authority to make decisions on the pitch. He should do so under the laws of the game. There should be two umpires in a hockey match. A reserve umpire also gets appointed in many higher-level events. A video umpire is also appointed besides the field and reserve umpires for World-Level competitions. The winner of the hockey game is the team with the most goals at the end of the match. The game is a draw if the scores are equal after 70 minutes of play. Croquet Rules: A simple guide to regulations used in the game of garden croquet. Ice Hockey Rules UK: A fast contact sport played, and fought, between two teams on an ice rink. Lacrosse Rules UK: A guide to lacrosse equipment, team tactics, and player strategies. Weird Sports and Games: A concise list of weird and wonderful sports from all around the world.